Slobodan Milosevic is buried in his Serbian home town a week after dying in his cell while on trial for war crimes. The UN war crimes tribunal rejects a request from Slobodan Milosevic to get medical treatment in Russia. Turning point for troubled trial? The BBC's Gabriel Partos examines a landmark genocide case brought by Bosnia against Serbia. 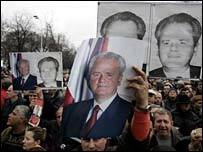 What is your reaction to the death of Slobodan Milosevic?